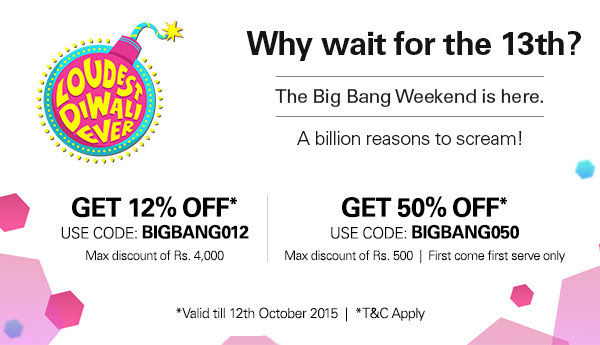 eBay Big Bang Weekend Offer - eBay has announced Big Bang Weekend offer which is valid till 12th October 2015. While Flipkart, Amazon and Snapdeal are getting ready for their biggest sales for the year 2015, eBay has announced its biggest sale called 'Big Bang Weekend Offer'. They tell their customer not to wait till 13th for purchasing products in loot deals. Here are some latest festival sale announcements from giant online shopping websites as part of Diwali Sale. Click on the links to read more details about the sale. How to avail this eBay Big Bang Weekend Offer? 2. Add items to your cart. 3. Apply the coupon code and buy. First come First Serve only. Coupon is not applicable on deep discounted items(if mentioned).